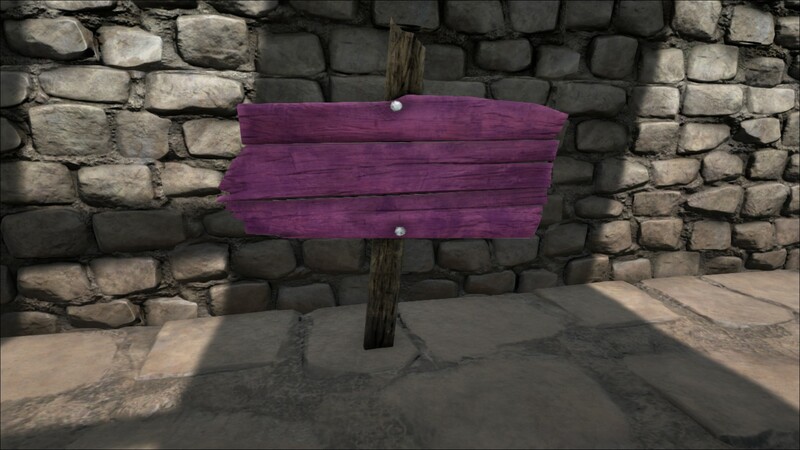 A simple wooden sign for landmark navigation or relaying messages. The Wooden Sign lets players display a short message to other players. If more space for a message is needed, the Wooden Billboard can be used. Edit the text as many times as needed with the use key (e, , ). To add a second line of text, use <br>. The Wooden Sign does not require a foundation for placement, and as such does not interfere with the spawning of natural resources. It does not snap to other structures. Despite being a wooden object, the Wooden Sign takes damage as if it were thatch. The Wooden Sign is treated as a thatch structure and can be damaged by anything except non-explosive ranged attacks. In addition to its preset paint regions, you can doodle on the Wooden Sign by "attacking" it with a Paintbrush, which will open the "Apply Paint" Menu. Then, click and drag your cursor over the 3D model (like a paintbrush) to draw anything you want. See Painting for more information on doodling. For more information on Paint Regions and how to use them, please view the Dye, Paintbrush, or Spray Painter pages. 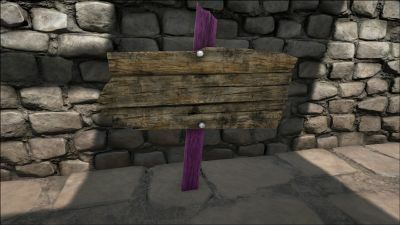 To load Ark PNT files into a Wooden Sign, the file name must be suffixed with _Sign_Small_Wood_C.pnt. The resolution is 128x128, and the aspect ratio in-game is 2.5:1. Also see Painting. This page was last edited on 31 March 2019, at 13:21.